Name of a place, first mentioned in connection with Abraham's return from the battle with Chedorlaomer, when Melchizedek, King of Salem, went to meet him (Gen. xiv. 18). Josephus ("Ant." i. 10, § 2; "B. J." vi. 10), the three Targumim, all the later Jewish commentators, and Jerome ("Quæstiones in Genesin," ad loc., and "Epistola LXXIII., ad Evangelum de Melchisedech, § 2), believing "Salem" to be a shortened form of "Jerusalem," identify it with the latter place (comp. Eusebius, "Onomasticon," s.v. 'Ιερουσαλήμ). This identification is supported by the expression "In Salem also is his tabernacle" (Ps. lxxvi. 2), which undoubtedly refers to Jerusalem. Still Jerome himself, alluding probably to the Biblical indication that Salem was in the neighborhood of the valley called "the valley of Shaveh" (Gen. xiv. 17), identifies ("Epistola," l.c. § 7; "Onomasticon," s.v. "Salem" and "Aenon") Salem with the Salim of John iii. 23, now called Salamias, which is situated in the Jordan valley, eight miles south of Scythopolis. The Septuagint reads in Jer. xli. 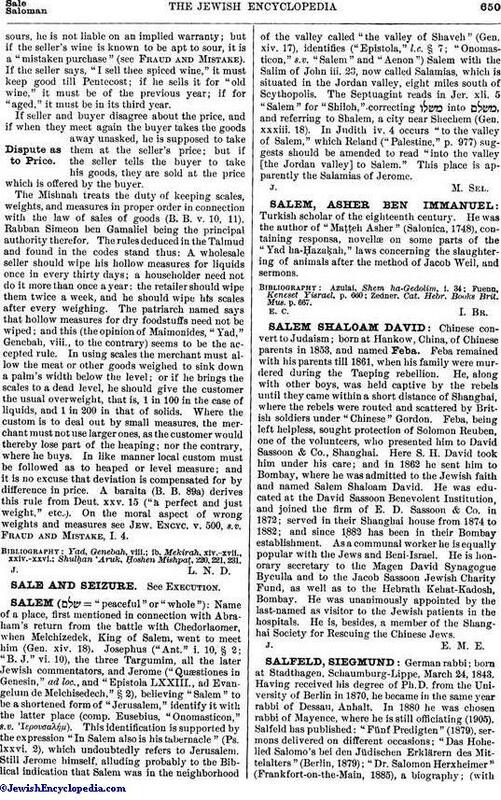 5 "Salem" for "Shiloh," correcting into , and referring to Shalem, a city near Shechem (Gen. xxxiii. 18). In Judith iv. 4 occurs "to the valley of Salem," which Reland ("Palestine," p. 977) suggests should be amended to read "into the valley [the Jordan valley] to Salem." This place is apparently the Salamias of Jerome.